Help save our trail! The County has approved a four story storage unit at 9201 Old Guilford Road, and has approved the entrance to the facility to be located along Old Guilford Road which functions as the defacto path link between the Patuxent Branch Trail and the adjacent Columbia Association Path. 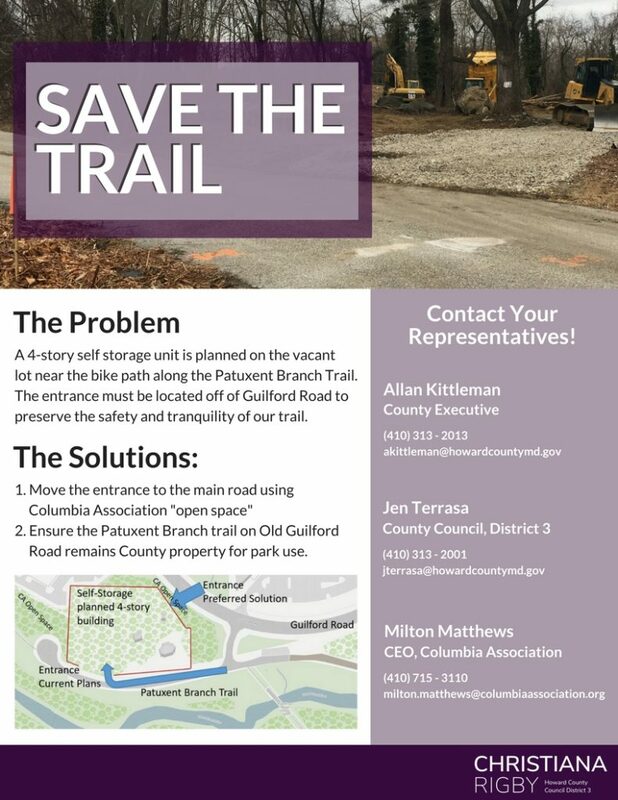 Email your current representatives to let them know we want the vehicle entrance off the main road (Guilford rd) to preserve the safety and tranquility of the path. My neighbor has started a petition and the signatures are climbing, please help amplify our voice. Here are the Site Development and Environmental Concept Plans for folks who are interested. Please share widely and help us save the trail!